In part 1 of our series, we found that when looking at the best trials, Homeopathy performed better than a placebo on a 2 to 1 scale. However, all these trials were before 1991. We are now going to look at more modern trials. The most recent homeopathic trials include a trial done by A Swiss-UK review of 110 trials found no convincing evidence the treatment worked any better than a placebo. We are going to examine the better done trials since 1991. We will not examine all of them but look at a fair amount of promising and not so promising evidence of properly conducted homeopathic trials. A randomized, double-blinded, placebo-controlled trial of 242 participants aged 18 to 55 years. Trial compared an oral homeopathic treatment to placebo in asthmatic people allergic to house dust. Authors found the homeopathic treatment "no better than placebo." They noted "some differences between the homeopathic immunotherapy and placebo for which we have no explanation." This was actually an attempt to replicate a successful homeopathic trial with allergies and asthma. No one could explain why the replication was not successful. This trial was much larger than the intial trial that proved successful. Randomized, double-blinded, placebo-controlled trial of 126 children; 116 completed the study. Individualized homeopathic treatments improved digestive problems in children with acute childhood diarrhea. Results are consistent with findings of a previous study. Randomized, double-blinded, placebo-controlled trial of 519 people; 400 completed the study. Homeopathic remedies, including arnica, are not effective for muscle soreness following long-distance running. Meta-analysis of six controlled clinical trials. Controlled clinical trials indicate that homeopathic remedies appear to work better than a placebo in studies of rheumatic syndromes, but there are too few studies to draw definitive conclusions, and efficacy results are mixed. The most promising remedy for Homeopathy according to our research is Oscillococcinum. There were several large trials showing positive results for Oscillococcinum in shortening the duration of the flu. Oscillococcinum shows that is has no effect on prevent the flu. Other successful trials on a smaller scale include perennial allergic rhinitis. The trials showed increased nasal flow as compared to the placebo. This was the fourth replication of this trial. It is noted the trial size was quite small. In conclusion, more research needs to be done but some Homeopathic remedies are showing promising results in large double blinded placebo studies. Larger studies after 1991 showed approximately a 1 to 1 ratio of successful and unsucessful homeopathic trials. Better quality studies before 1991 showed approximately a 2 to 1 ratio. A couple of the trials have been reproduced in several studies. Oscillococcinum was the only study that we found was reproduced several times by different researches. Here at Hmedicine.com, we get this question quite a bit. We are going to answer this question in detail now. Homeopathic single remedies are generally prescribed by homeopathic doctors or physicians. Homeopathic single remedies look to treat the whole person and not just the symptoms. The single remedies are prescribed for chronic conditions but maybe used for any other health conditions. People may also self prescribe homeopathic medicines for non serious conditions such as pain, cramps and other conditions. However, this does take some time and research to figure out what homeopathic single remedy do I need. Also, what potency should be required. You may need a homeopath doctor help to figure all of this out. This is where homeopathic combination remedies come into play. Homeopathic combination remedies such as Hylands Calms Forte put typical homeopathic single remedies and lower potencies into the homeopathic medicine. Calms Forte contains several homeopathic single remedies that are used for sleeping disorders. The homeopathic combination remedies also has a low potency dosage ranging from 3X-30C. The homeopathic combination remedies take the guess work out for the homeopathic customer. The main problem with homeopathic combination remedies is that they are not individualized like single remedies. A person with a sleeping disorder may need a homeopathic medicine that Calms Forte does not contatin. They may also need a higher or lower potency than what Calms Forte has. Most people in the homeopathy field agree that homeopathic single remedies work better than homeopathic combination remedies. However, combination remedies make a good choice for a novice user in homeopathy that has a mild condition and has no time to figure out what single homeopathic remedies that they need. Argentum nitricum: Indications for this homeopathic remedy include dizziness, faintness, nausea, retching, and possibly balance or perception problems. The person may feel claustrophobic or be extremely anxious and excitable. Eating too much sweet or salty food may have contributed to the problem. Arsenicum album: A person who needs this homeopathic remedy is likely to be very anxious and feel both restless and exhausted. Nausea and vomiting can be accompanied by burning pain. The sight and smell of food, or odors of any kind, may make the nausea unbearable. The person may feel a burning sensation in the throat or stomach and want frequent sips of water. Borax: Indications for this homeopathic remedy include nausea, gas, and possibly diarrhea. The person has a fear of any downward motion (as is felt on a plane or roller coaster) and can be made sick by it. The person may also be very sensitive to noise, warm temperatures, and cigarette smoke. Bryonia: A person needing this homeopathic remedy usually wants to stay completely still and not be talked to or touched. Nausea and vomiting, with pain and pressure in the stomach, can be worse from even minor movements. The person may have a dry mouth and want cold drinks. Cocculus: Indications for this homeopathic remedy include dizziness, palpitations, headache, numbness, and an empty or hollow feeling in various parts of the body. The person may talk nervously, yawn, or tremble, and is likely to feel extremely weak. Problems are often worse after getting cold, and from not getting enough sleep. Kali bichromicum: This homeopathic remedy is indicated when vertigo and nausea are intense, and bright yellow fluid is vomited. The person feels worse from standing up, and can be very weak. Aching may be felt in facial bones or in small spots on the head. This remedy is often helpful during seasickness. Petroleum: A feeling of empty nausea in the stomach, accompaned by cold sweat and excessive salivation can indicate this remedy. An ache in the back of the head and neck may be present. Food and warmth may bring some mild relief. Sepia: This homeopathic remedy is indicated when the person (often a woman or child) feels dizzy and irritable, and the nausea is made worse by lying on one side. A headache will often accompany these problems. The sight of food can intensify the nausea, although the person may still want sour things. 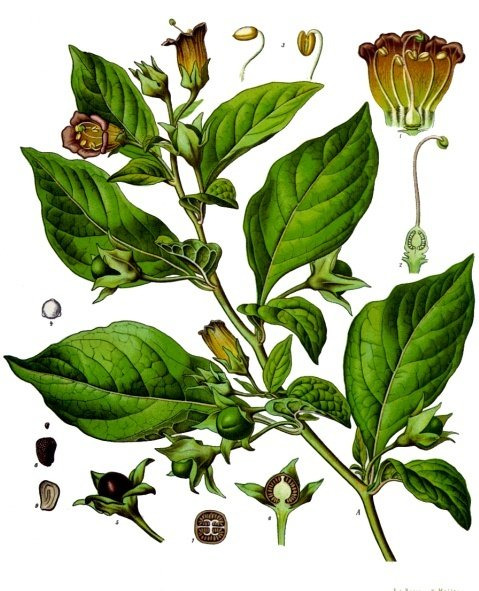 Tabacum: Indications for this homeopathic remedy include violent nausea and vomiting with a terrible sinking feeling in the pit of the stomach, pale face, cold sweat, and icy feet and hands. Some relief may come from breathing cold, fresh air. Select the homeopathic remedy that most closely matches the symptoms. In conditions where self-treatment is appropriate, unless otherwise directed by a physician, a lower potency (6X, 6C, 12X, 12C, 30X, or 30C) should be used. In addition, instructions for use are usually printed on the label. Many homeopathic physicians suggest that homeopathic remedies be used as follows: Take one dose and wait for a response. If improvement is seen, continue to wait and let the remedy work. If improvement lags significantly or has clearly stopped, another dose may be taken. The frequency of dosage varies with the condition and the individual. Sometimes a dose may be required several times an hour; other times a dose may be indicated several times a day; and in some situations, one dose per day (or less) can be sufficient. Using a homeopathic remedy that covers isolated symptoms superficially, but does not fit the person on deeper levels, may change or suppress the symptoms, yet not be deeply curative. An inexperienced or impatient person might be tempted to repeat theh homeopathic remedy unnecessarily, or change to other remedies at times when waiting is appropriate. If an illness or condition is chronic or deep-seated, it is best to consult an experienced homeopathic practitioner, for a “constitutional” remedy that fits the characteristic symptoms of the case and considers the person’s physical condition and individual nature in a more comprehensive way. A typical first visit, a homeopath interviews a patient for at least an hour—to take a careful history and elicit information about many aspects of the person’s state of health—before choosing a remedy.